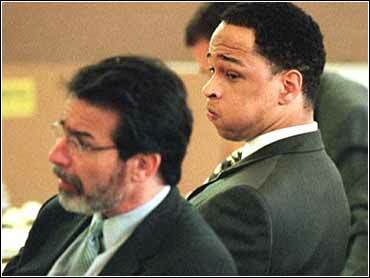 The man who admitted killing Rae Carruth's girlfriend said he shot Cherica Adams because he was angry, not because Carruth paid him to attack the woman, a jailer who guarded the defendants testified Friday. Shirley Riddle, a deputy sergeant with the Mecklenburg County Sheriff's Department, said Van Brett Watkins told her he shot Adams, who was eight months pregnant, because he was mad at Carruth for backing out of a drug deal. "It was Rae's fault," she said Watkins told her in December 1999. "If he had just given us the money, this never would have happened." Defense attorney David Rudolf said in his opening statement that Watkins killed Adams on his own, not because Carruth paid for a hit in order to avoid having to pay child support. Carruth, 26, could be sentenced to death if convicted of murdering Adams, who died a month after she was shot. Their child, delivered immediately after the shooting, lives with Adams' mother. Riddle testified that Watkins told her he snapped when Adams made an obscene gesture at him from her car. "I just lost it," she recalled Watkins saying. "I lost control and I shot her." Riddle also testified Friday that she was asked by her bosses to keep quiet about conversations that could have provided a drug-related motive for the murder of Adams. During his testimony, Watkins vehemently denied ever making any jailhouse confession to Riddle, telling jurors not to believe her when she came to court. The trial, which began Oct. 23, went into a holiday recess until Jan. 2 after her testimony. Riddle also testified she overheard a jailhouse phone conversation in which Watkins tried to get a message to a woman named Candace, warning her not to talk with the police. The defense maintains he was referring to Candace Smith, Carruth's ex-girlfriend, warning her to keep quiet about the drug deal. Riddle said she tried to file an incident report on Watkins' phone conversation in March, after Carruth had mentioned the name Candace Smith to her. But her superior, Cmdr. Bruce Treadaway, urged her not to file the report, she said. "I think this case is pretty well wrapped up," she said Treadaway told her. "Besides, I think the police have already talked to her (Smith)." Riddle said she finally talked to another jailer, Sgt. Tom Stamps. Stamps testified Friday that he went to Rudolf with the information because he feared both he and Riddle would lose their jobs if he went to the sheriff's department or the police. In his cross-examination, prosecutor Gentry Caudill questioned why both jailers didn't come to the district attorney's office with information about Watkins' alleged confession. During his two days on the witness stand this week, Watkins was by turns confident, tearful and argumenttive, insisting Carruth threatened and badgered him into killing Adams on Nov. 16, 1999. "I fired one shot, then four more shots: bam, bam, bam, bam," he said Thursday. "She was screaming. She was drowning in her own blood. You could hear a gurgling sound." Watkins avoided a possible death sentence by pleading guilty to second-degree murder. He had agreed to testify for the prosecution, but was instead called to the stand by Carruth's defense, trying shore up its contention that Watkins shot Adams on his own. Watkins denied the scenario Wednesday. "He (Carruth) hired me as a hit man," Watkins said. "He hired me to kill Cherica Adams and the baby."